In an event that may convince you to finally start cooking dinner for yourself, a woman was bitten three times by a copperhead snake at a steakhouse restaurant in Fredericksburg, Virginia. Rachel Myrick was crossing the foyer at the local LongHorn Steakhouse with her boyfriend and 13-year-old son when she felt a sting she assumed was from a bee (or something less horrifying than a living, venomous snake inside a casual dining establishment). The pain, however, quickly became excruciating. When she put her hand to the wound she discovered the 8-inch pit viper snake, its fangs still lodged into her left foot. She remembers yelling out, "I got bit, I got bit," according to local paper The Free Lance-Star. Her boyfriend and son quickly stomped on the snake and called for help. Myrick was taken to the hospital, where she stayed for the next five and a half days as her foot swelled up to twice its size. She's currently on crutches, but recovery is expected to take roughly three months. While these bites are rarely fatal, they're extremely painful and fairly common. 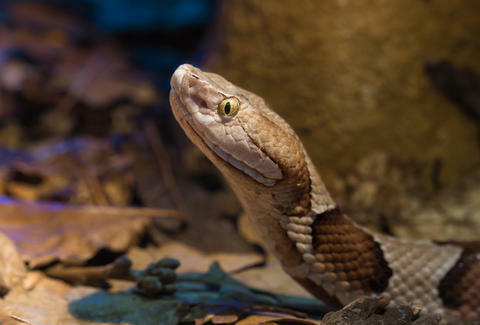 The copperhead is one of the most prevalent legless, squinty reptile demon creatures in Virginia and one of the most likely to bite. No one is sure how the snake got into the restaurant, but its small size probably meant it slithered in unnoticed. "This was a highly unusual incident," a LongHorn spokesperson said in a statement. He added that they are "working with our facilities team to see how this may have occurred and we are taking steps to prevent it from happening again." Hopefully, this plan involves LongHorn Snakehouse -- sorry, Steakhouse -- funding an effort to relocate all snakes to a special island where they're guaranteed to never to ruin anyone's dinner again. In the meantime, maybe ask your mother how to make pasta and just never leave the house. James Chrisman is a Copy Editor at Thrillist who apologizes if you're really into snakes. Send news tips to news@thrillist.com and follow him on Twitter @james_chrisman2.